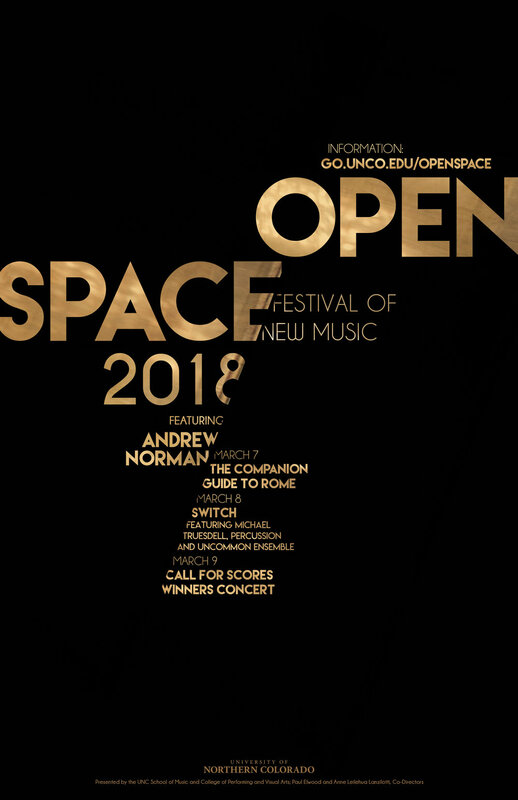 We're excited to welcome Andrew Norman to University of Northern Colorado for the 10th Annual Open Space Festival of New Music! The festival will take place March 7–9, 2018 and feature performances by UNC students and faculty. 7:30 p.m., Montfort Concert Hall, Union Colony Civic Center, 701 10th Ave: Concert of the music of Andrew Norman featuring Mike Truesdell, UNC Assistant Professor of Percussion, UNC Symphony Orchestra under the direction of Russell Guyver, and Uncommon Ensemble performing Farnsworth: Four Portraits of a House, and Try conducted by Inés Rodríguez. 7:30pm, Milne Auditorium, Kepner Hall, University of Northern Colorado. Works by guest composer-performer Simon Rowland-Jones, and the winners of this year's Open Space Call for Scores: Armando Bayolo, Ron Coulter, Howard Kenty, Zachary Pierce, Andrew Sigler, and Suzanne Sorkin.